← The Relationship Destroyers’ Vendors!!!! Our Newest ADD— Katrina Avant! Relationship: Do Not Give Yourself….. Giving yourself in a relationship means giving the relationship everything you’ve got— with the exception of money, outside of being an organ donor, and outside of providing a place to stay. Donating any part of your body, as some people are doing, should, at the very least, come with the understanding that you are giving away an organ for a lifetime— whether the relationship lasts or not. You can’t just grow back a liver or kidney. This type of decision mandates input from family, closest friends and your God. Never make this decision by yourself. A healthy relationship is not built from money, shelter, and organ donations. The core of a healthy relationship is not based on necessity otherwise it will always be based on necessity. This puts the relationship far from the meaning of relating. Instead of relating to each other emotionally, mentally, spiritually, intimately, sexually, and historically, we are merely simulating a relationship. The relationship may have begun with loving affection, but to build it on the foundation of sympathy, need and pity, only results in separation down the road. A relationship must have a fighting chance to be successful. If the reason for being together is based on the needs of a partner and the continual giving of the other partner, a break in the balance occurs. The emotional ties that bind become broken. This is due to the fact that mostly everything is centered around the incessant needs of the partner. We would normally call such a needy person a charity case. A charity case in a relationship is not a relationship. Giving yourself in this way is not the way. The couple in this type of situation is building more of an arrangement, rather than a relationship. I would argue that there is a superficial bonding appearing real, but this is because of the partner’s goodness in giving, not because of an authentic connection. There is no time to build authentically. The focus just isn’t there. Every effort is being made to help the needy partner, and the direction for the relationship is off course. The receiving partner is tied to the relationship because there is a “receiving” reason to do so. This may be misleading, because it appears to be a connection, when the main connection is primarily from your giving hand to theirs! We are thinking and hoping the person to whom we have given much will be with us forever, because of Love, gratitude and loyalty. Most times these relationships fail because the needy partner becomes entitled, and hangs on, while the giving partner feels used and taken for granted. It is important to analyze what behaviors or skill our needy partner is lacking that disallows him/her from making their own way? Why can’t they handle their own needs? These deficiencies will hurt the relationship down the line in the areas of finance, budgeting, taking, and giving, while having very little gratitude due to a developed sense of entitlement. The providing partner will most likely be in control of the relationship, by control of the finances, or the needy partner will be the controller by taking advantage and eventually manipulating the giving partner— if he/she is not working to self sustenance. Until we know where the relationship is heading for the long term, we are giving our goodness in good faith. And considering this process takes time, then use this time to become familiar with each other and being good to and for each other. When we bring together our experiences, knowledge, hearts, wisdom, our best self, respect, emotions, fears, wins in life, our love, the lessons from love lost, and sexual passion, we are relating to each other from the core of who we are, versus from the external and material part of us. When we give from the core of who we are, we are relating in a way that is authentically bonding. 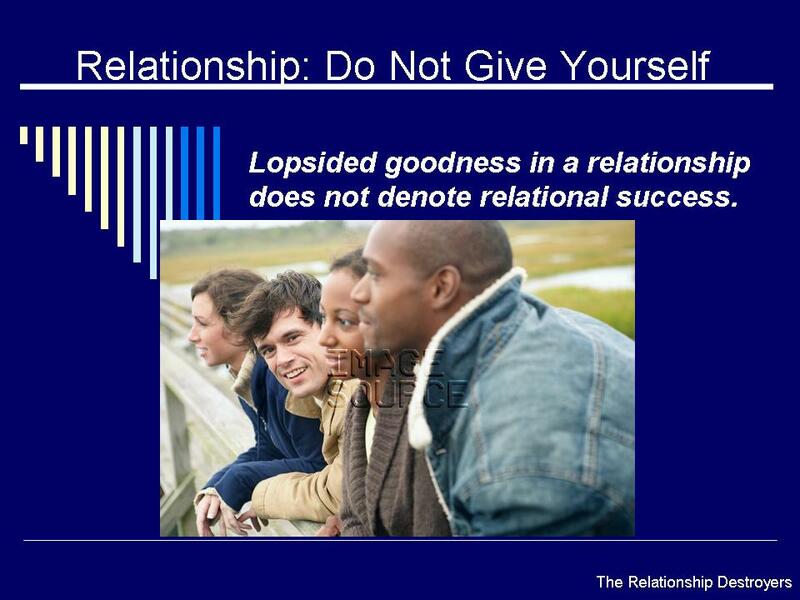 Lopsided goodness in a relationship does not denote relational success. This entry was posted in Destroy and tagged a relationship with a needy partner, being an organ donor in a relationship, giving at a sacrifice in a relationship, giving too much in a relationship. Bookmark the permalink. 4 Responses to Relationship: Do Not Give Yourself…..
Has me thinking about some of my relationships. Now why did I know that you were the giver? LOL, um, that magical moment when I tell people they can host there own WP sites? Of course, that would be one, but it shows through your posts also. You cook for others, and you empathize with others. Have a good day my Friend!